Having now firmly established themselves on the Midlands scene, recorded and released some vinyl and had a number 1 hit (In Wolverhampton) their status as local heroes was beginning to gather momentum. 1967 would see the band continue their music business apprenticeship which would include a trip down to London to record at the famed and prestigious Abbey Road Studios while The Beatles were in residence recording 'Sgt Peppers Lonely Hearts Club Band'. The track they recorded as a demo, 'Delighted To See You' failed to interest anyone with any sway and they were quickly rejected as being of any worth with regard a long term contract being offered. No matter, the band had got to record at Abbey Road while the fab four were at home recording a soon to be classic album. Undeterred they returned to the Midlands with renewed vigour to be a success and a split from the Astra Agency and management with a different approach took place. They continued to be very much in demand for live appearances whenever one of the 'Big Name' bands rode into town looking for top notch support. 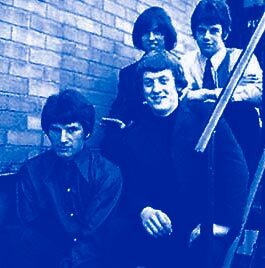 If anything, then 1967 was a year when the band got to know each other, it was the first full year they had been together as a unit all with the same dream of success, all other activities outside of being in a band and gigging relentlessly were put to one side. It was this sheer collective single mindedness that was to get the band through some of the tougher times, and indeed probably helped them when a decade later after having been at the top they suffered an ignominious fall from grace which saw them slumming it around the various 'chicken in a basket' venues. This information is presented here in its most basic form, for those of you wishing to flesh out the bones of the story of these early days then simply follow the link to Michael Parkers excellent pages on the subject.